Pew study shows social media doesn’t stress people out, but “cost of caring” is real. 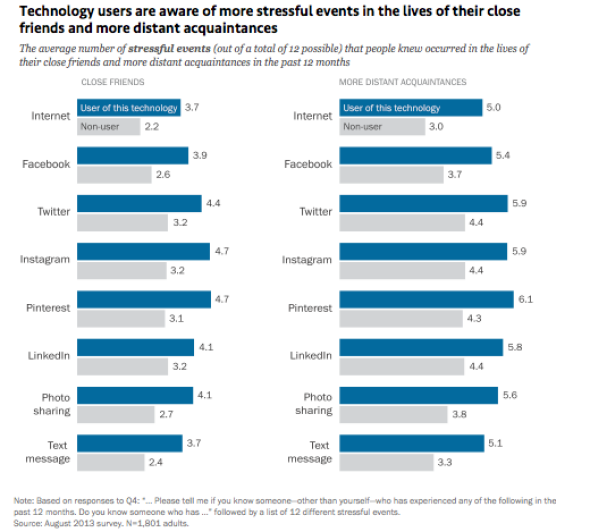 Though social media users aren’t more stressed than nonusers overall, they do experience the “cost of caring” because they are more exposed to bad things happening to others. People often say, “I had a stressful day.” I know I hear it enough to conclude that everyone around me is swamped. It seems like a given that all of the glowing screens and Facebook notifications around us are contributing to that anxiety. But new findings from the Pew Research Center reveal just the opposite. The survey looked at technology users and nonusers, including light and heavy users, and attempted to establish some baseline information, like the fact that people who are married or live with a partner tend to report lower stress, or the fact that women report more stress than men. From there the researchers worked to home in on stress from technology in particular. They found that social media, mobile devices, and the Internet in general didn’t contribute to increased stress for men compared with men who did not use technology. And for women who used technology, there was even some slight stress reduction. For example, in the average-technology-use category for women (those who use Twitter several times a day, send and receive 25 emails per day, and share two photos on a mobile device per day), the study found 21 percent lower reported stress compared to women who don’t use technology. Sign me up. It’s not all cat memes and “Gangnam Style,” though. The study did extensive analysis on the concept of the “cost of caring.” Social media allows people to keep closer tabs on most of the people they know, and just as this raises awareness of good things like promotions, marriages, vacations, and births, it also increases exposure to bad things like layoffs, hospitalizations, and crimes. These tragedies weigh heavily, and technology users are more aware of them than nonusers. Facebook is particularly good at spreading the “cost of caring.” Facebook users of both genders were aware of more bad things happening to loved ones (13 percent more aware for women, and 8 percent more aware for men).